From May 28 to June 14, 2015 Theater for the New City, NYC will present the U.S. premiere of “Maximum Security,” a new play by Piedad Bonnett, the internationally acclaimed Colombian writer, performed in English translation (world premiere) by Lucia della Paolera and acted by a cast of Latino actors. The play is a brutally realist account of life behind bars for three inmates and a guard, offering a rare look at the prison culture surrounding political prisoners and the unlikely friendships they adapt to when surrounded by a violent and sociopathic population. It is directed by Nelson Celis of Bogata, Colombia’s La Compania Nacional de las Artes (www.lacna.co) and co-produced by ID Studio Theater, a NYC theater company that works with a mix of theater professionals and undocumented Latino immigrant communities to create works of artistic and social impact. LR: Wilmar Saldarriaga, Cesar Morales and Victor Grajales as the inmates. Photo by Jonathan Slaff. Set in a penitentiary in Colombia, a country with notoriously overcrowded and violent prisons, “Maximum Security” explores the lives of three cellmates and one guard as they navigate a labyrinth of degradation and survival tactics behind bars. The provocative play offers an unflinching glimpse into the daily psychological, social, and physical battles fought by the people held within a deeply flawed justice system. Three incarcerated men-at various stages of their “careers” as inmates-form uneasy friendships and alliances, strategizing and bartering with each other and the guards for access to basic goods and protection from a variety of shifting threats. There is rampant sabotage and subterfuge, mental and physical sickness, rotten food, water shortage crises, and scant medical care. Inmates are periodically thrown into the dreaded “hole,” a torture chamber, and emerge only to find themselves in the midst of a series of explosive, divisive riots. Meanwhile, intensive conversations, a result of the singular intimacy developed between people forced to spend days on end together, reveal the circumstances “outside” that turned the three men into prisoners. Delving into the depths of despair and political and personal indignation, “Maximum Security” is marked by a palpable mix of existential fury and black humor which here become survival tactics themselves. Summarizing the play, author Piedad Bonnett remarked in a Colombian press interview, “Prison is an exaggerated version of the outside world, a metaphor for the entire country, where the word is risky, and people dream of getting out, but also of returning to crime. A world without redemption.” She a well-known Colombian poet, playwright and novelist whose work have been widely translated and published world-wide. She is best known as a poet of clear language imbued by irony and deep feeling that explores the subjects of love and the harsh realities of life in Colombia. Her writings are profoundly linked to her life experiences and vision as a middle class woman in a country torn by violence, inequality and conflict. Childhood, family life, and an enchantment and disenchantment with different kinds of love are present across her work, including filial, romantic and friendship, which she describes as one of the most beautiful and pure kinds. Her body of work includes eight poetry books, five plays, screenplays and novels. In 2013, she published “Lo que no tiene nombre,” a personal testimony about the struggles of her son with mental illness. Other noteworthy publications include her award-winning first volume of poems, “De circulo y ceniza” (1989), and her dictionary of the most important concepts of a Nobel Prize-winning fellow countryman, “The world according to Garcia Marquez” (2005). She has a degree in Philosophy and Literature from the Universidad de los Andes University of Los Andes (Colombia), where she has been professor at the Faculty of Arts and Humanities since 1981. In the hour before the performances of May 28 and June 11, there will be panel discussions on the topic of prison reform and prisoners’ rights in Colombia, the US, and at large, moderated by German Jaramillo, Director of ID studio. Translator Lucia della Paolera received her BA in English and Music from University of Pennsylvania in 2010. Her translation of “Jorge Luis Borges Sobre La Escritura,” a book of conversations with the Argentine writer, is forthcoming. She also interprets and translates for Safe Passage and African Services Committee, organizations which provide free legal assistance for undocumented immigrants facing possible deportation. She organized the panel discussions on prison reform that will precede select performances of this play. 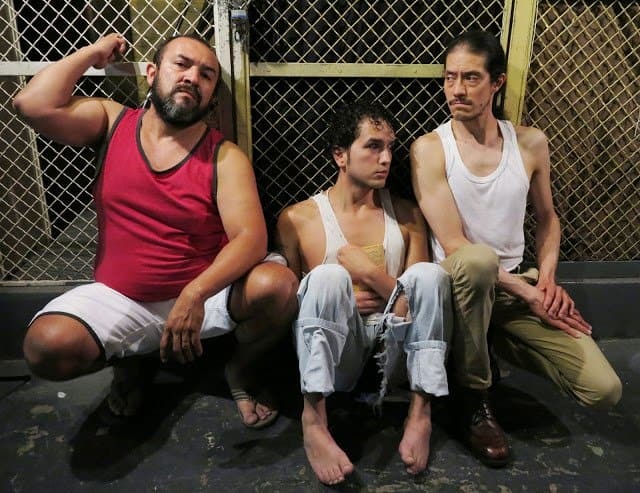 The cast includes Victor Grajales, Wilmar Saldarriaga and Cesar Morales as the inmates and Leonardo Gonzalez as the guard. Sound Design is by Pablo Mayor. Stage and lighting design are by Miguel Angel Valderrama. Costumes and visual design are by Daniel S. Salguero. Theater for the New City will present “Maximum Security,” May 28 untill June 14, 2015 at Theater for the New City, 155 First Ave.(East Village). The play is produced by Theater for the New City with the participation of ID Studio Theater (New York) and La Compania Nacional de las Artes (Colombia). Performances are Thursdays through Saturdays at 8:00 PM and Sundays at $3:00 PM. Tickets are $18.00 and $12.00 for seniors and students. The box office number is (212) 254-1109 and tickets can be purchased online at www.theaterforthenewcity.net.